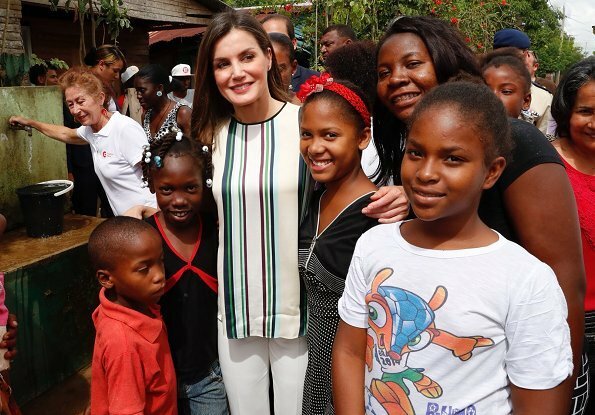 Queen Letizia of Spain is making a working visit to Dominican Republic and Republic of Haiti between the dates of May 20-23 to see on site the projects implemented with the cooperation of Spain. 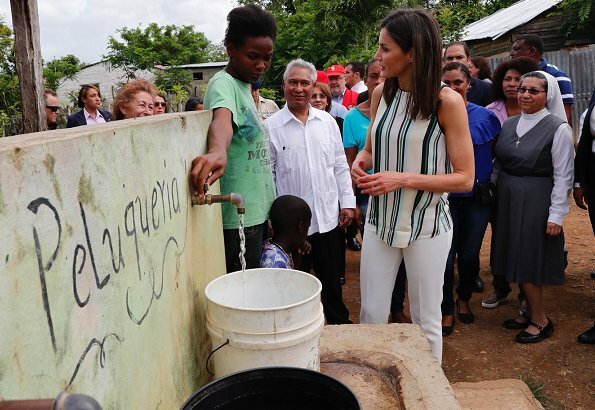 The visit program started in Monte Plata Province where Spanish Agency initiated a water distribution project in a very disadvantageous region. 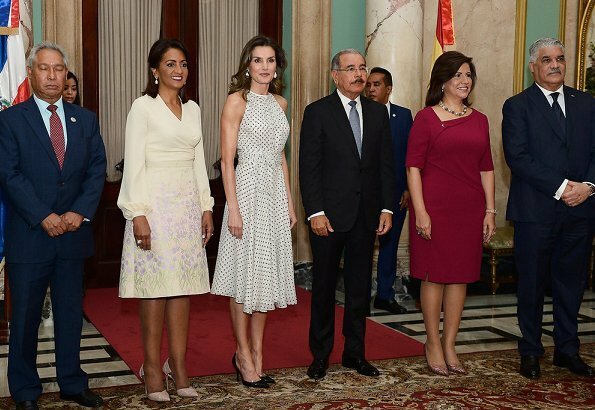 On the same day, Queen Letizia attended a lunch at Presidential Palace in Santo Domingo, hosted by President Danilo Medina and First Lady Cándida Montilla. 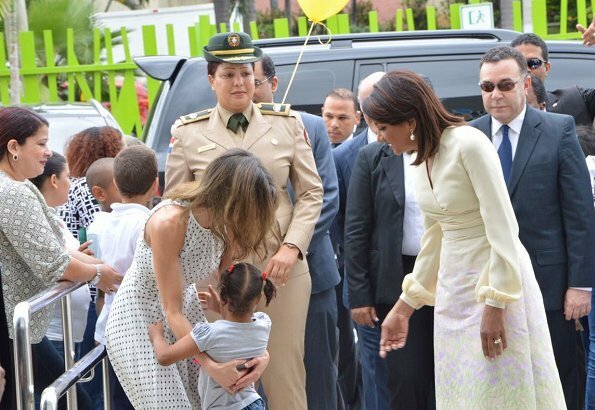 Afterwards, Queen Letizia visited CAID (Centro de Atencion Integral para la Discapacidad) which is a comprehensive Care Center for disabled people, together with First Lady Cándida Montilla. 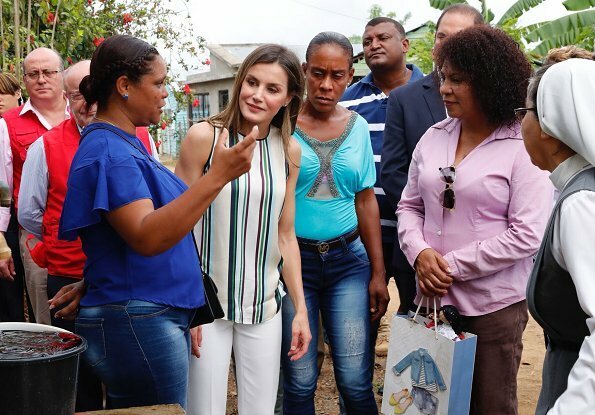 Then, Queen Letizia attended a working meeting with representatives of Dominica Technical Cooperation Office at Santo Domingo History Center. 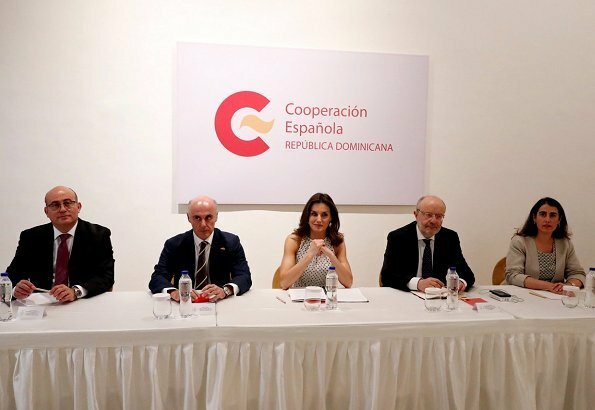 Thereafter, the Queen met with representatives of Spanish nongovernmental organizations present in Dominica at Spanish Culture Center and attended an event celebrating 30th anniversary of Spanish cooperation in the country. Super nice dress, the other outfit very proper for the occasion. Letizia also has a very relaxed smile on this trip. Nice appearances. I like the first outfit although if it had been me there would have been great dirty marks all over those white trousers within about 30 seconds of putting them on. The polka dot dress is beautiful- very nice. Perfección en ambos atuendos. Ropa cómoda y amplia con zapatos planos en la visita de campo y ese vestido maravilloso, femenino y con gran movimiento para el almuerzo. Bellísima y trabajadora Letizia. I agree with Angie, and her smile is her best accessorie. Esta cumpliendo un buen trabajo , feliz rodeada de niños , escuchando siempre con mucha atencion las explicaciones. 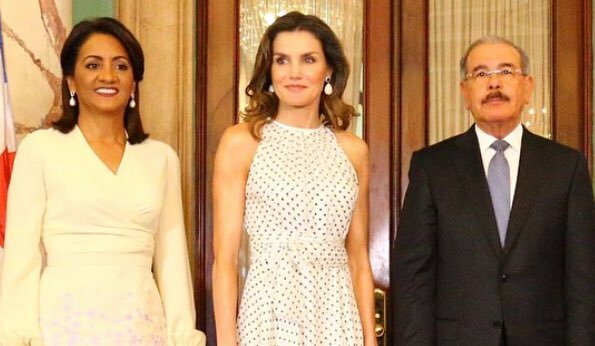 La ropa me ha gustado mucho , muy bella la reina Letizia. Love the polka dot dress and earrings, classic and stunning!